Sun Te Kong temple is located not far from Sengarang Port. This temples have been around 300 years old is the oldest temple in Senggarang. The establishment and existence of this temple is almost the same time with Sengarang resided. At first, the building of this temple still looks highly simple compared to current conditions, this temple is known as the temple of the god of fire, people of Chinese descent who came to this temple to pray to invoke happiness. Form of the building is smaller than the temple Sun Te Kong. 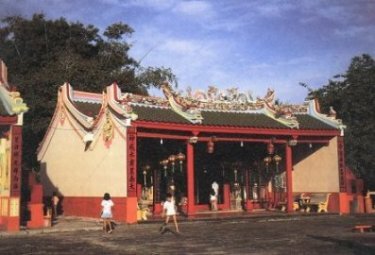 This temple was founded in the 17th century by the Chinese community who live senggarang. The building was never been renovated since 1987 just the interior decorations is added some improvements in some parts. Tay Ti kong temple was built in conjunction with Marco. This temple lies parallel to Marco Temple, but the building is smaller and at the end. Tay Tikong temple is still well maintained. Tay Tikong temple known as the the god of earth at the local Chinese community, They believed if praying in to this temple when will have a good harvest for paddy rice field, and can build a house. The location of Banyan temple (Tien Shang Miao) not far from the beach. This temple is believed to have lived 200 years. This temple was formerly a residential home Kapitang. He was a village headman in Senggarang. After the term ends, the Chinese community used this place to reminisce over him. Because of old age, the building is much overgrown with banyan tree that covers the roof of the outer wall. Therefore, this temple is called the Banyan Temple. The majority of the building currently have been lost, which left only partially used as a place of worship and Chinese communities.